Requirements management benefits from streamlined templates that not only define projects quickly, but ensure nothing essential is overlooked. Data engineering receives two new "hyper modeling" techniques, yielding data warehouses that can be easily adapted when requirements change without having to invest in ruinously expensive data-conversion programs. Quality assurance advances with not only a stereoscopic top-down and bottom-up planning method, but also the incorporation of the latest in automated test engines. Who Shall Write the Tests? When Should Teammates Perform Their QA Duties? Where Should Teammates Perform Their QA Duties? How Many Testers are Needed? Ralph Hughes, former DW/BI practice manager for a leading global systems integrator, has led numerous BI programs and projects for Fortune 500 companies in aerospace, government, telecom, and pharmaceuticals. 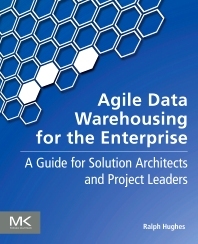 A certified Scrum Master and a PMI Project Management Professional, he began developing an agile method for data warehouse 15 years ago, and was the first to publish books on the iterative solutions for business intelligence projects. He is a veteran trainer with the world's leading data warehouse institute and has instructed or coached over 1,000 BI professionals worldwide in the discipline of incremental delivery of large data management systems. A frequent keynote speaker at business intelligence and data management events, he serves as a judge on emerging technologies award panels and program advisory committees of advanced technology conferences. He holds BA and MA degrees from Stanford University where he studied computer modeling and econometric forecasting. A co-inventor of Zuzena, the automated testing engine for data warehouses, he serves as Chief Systems Architect for Ceregenics and consults on agile projects internationally.